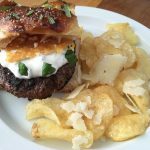 Season Burgers with rosemary salt on both sides about 15 minutes before cooking. Cook Burger over medium-high heat on skillet or flat-top grill, then flip once, making sure both sides are seared. Cook about 3-4 minutes per side. 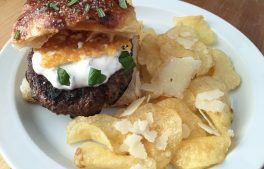 Put Burger on Focaccia, add one dollop of basil aioli, place frico chip on top. Shred (not grate) Parmesan cheese. On a baking sheet with parchment, make 4 flattened mounds. Bake for 5-7 minutes or until brown. Place basil, egg yolks, lemon juice, and salt in food processor. Pulse to combine. Slowly add each oil, about 1 minute. Cover rosemary with Kosher salt for 24 hours.